Decades ago when he was in grade school, Christopher Walker stepped outside with his father to see the NASA all-aluminized Echo balloon cross the nighttime sky in Earth’s orbit. That early space spectacle stuck with him, he explains, and unknowingly, was a reflection on his future. Fast forward several decades. Today, Walker is a professor of Astronomy and an associate professor of Optical Sciences and Electrical Engineering at the University of Arizona in Tucson. Walker’s winning NASA Innovative Advanced Concept (NIAC) Phase II proposal in 2014 investigated the prospect for a 33-foot – suborbital large balloon reflector, or LBR for short. Looking up from a height of some 120,000 feet above the Earth, the sensor-laden LBR can serve as a telescope. 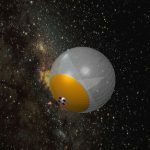 Walker’s telescope would consist of an inflatable, half-aluminized spherical reflector deployed within a much larger, carrier stratospheric balloon, about the size of a football field. The outer balloon would double as a protective structure or radome once it is positioned. 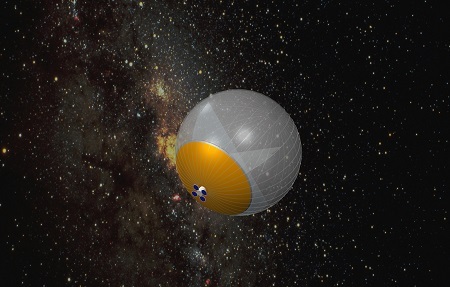 A preliminary illustration of a 20-30 meter telescope, the space-based Large Balloon Reflector called the TeraHertz Space Telescope (TST) for probing the evolution of the universe through cosmic time. Looking down and out, the LBR’s mission could involve Earth remote sensing by carrying out precision looks at the outer edge – or limb – of our planet and studying the atmosphere and greenhouse gases, Walker says. LBR has the capacity to become a hub to support telecommunication activities too, he adds. But the looking up can clearly provide an astronomical plus. That is, by combining suborbital balloon and telescope technologies, this 33-foot class telescope would be free of roughly 99 percent of the Earth’s atmospheric absorption – perfect for scanning the universe in the far-infrared. Walker is a supporter of NIAC and its mission to nurture visionary ideas that could transform future NASA missions with the creation of breakthroughs-radically better or entirely new aerospace concepts-while engaging America’s innovators and entrepreneurs as partners. Walker’s early NIAC work centered on bringing the LBR concept to a technology readiness level of at least 2 or 3 in maturity, as well as addressing key unknowns, assumptions, risks, and paths forward. Walker is now hard at work parlaying his NIAC Phase II research into development of a “space-based” version of LBR. This space-based adaptation is dubbed the TeraHertz Space Telescope (TST). If deployed, the TST would be a telescope for probing the formation and evolution of galaxies over cosmic time. TST would operate at wavelengths longer than the James Webb Space Telescope (JWST), but due to its size, will have the same or better angular resolution and sensitivity. While buoyed by the TST idea and other possible applications, Walker is quick to add that technology readiness levels remain to be grappled with. Furthermore, he’s fully aware that dollar resources are precious. “This concept is different from the more traditional, costly approaches of building a telescope for space. It’s a tough road ahead, but we’ll keep pushing forward,” Walker says. “I’m hopeful I can get people motivated and excited about the concept…to think outside the box,” he explains. This entry was posted in Balloons, Helium Balloons, New technology, Stratospheric Balloons and tagged Christopher Walker, helium balloon, high altitude helium balloons, NASA, Stratospheric balloon, TeraHertz Space Telescope. Bookmark the permalink.